For the swimmer, see Zhao Tao (swimmer). Zhao Tao (born 28 January 1977) is a Chinese actress. She works in China and occasionally Europe, and has appeared in 10 films and several shorts since starting her career in 1999. She is best known for her collaborations with her husband, director Jia Zhangke, including Platform (2000) and Still Life (2006). 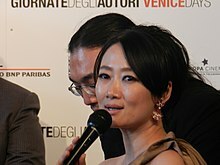 With Shun Li and the Poet (2011), she became the first Asian actress to win a prize at David di Donatello. She received two Golden Horse Award nominations for Mountains May Depart (2015), Ash Is Purest White (2018). ^ "Constant Muse: Jia Zhangke's leading lady Zhao Tao". China Film Journal. 24 March 2008. Retrieved 1 May 2008. ^ "5 September". La Biennale di venezia. Retrieved 4 September 2011. Wikimedia Commons has media related to Zhao Tao. This page was last edited on 1 February 2019, at 22:33 (UTC).